ABC Television. 1968. Producer: Allan Ashbolt. Music: Sven Libaek. 45 (ST) Festival. FK-2194. (m). 1968. A Southern Production. 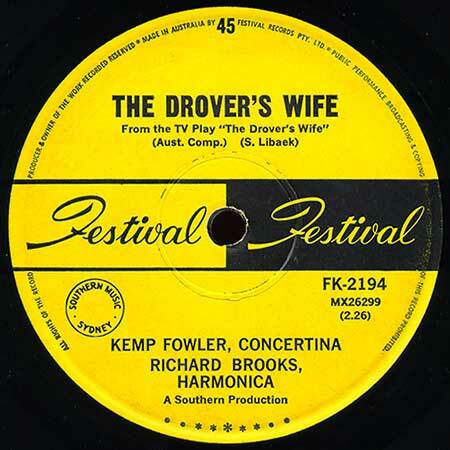 Side a: "The Drover's Wife". (2:26). (S. Libaek). Kemp Fowler - Concertina, Richard Brooks - Harmonica. Side b: "Music Of The Evening". (2:13). (S. Libaek). Kemp Fowler - Concertina, Richard Brooks - Harmonica.